Introducing the AquaCalc Pro Plus! A battery meter that indicates the battery charge remaining. We’ve improved a classic: Easier to use than any AquaCalc before. The improved user interface allows you to make USGS quality one, two, and three point measurements easily and accurately, quickly review measurement in the field, and automatically download and review your measurements on your computer. Compatible with all impluse or “click” type current meters including Rickly Hydrological Price AA and Pygmy type current meters, Hydrological Services Redback AA current meters, Ott type horizontal axis current meters, and electronic current meters like the Gurley Optical Head current meters. For more information see Using Custom Current Meters here. Can also be used with the JBSI Digital Pygmy Magnetic Head for the Pygmy current meter. H ardware design includes a rugged case with full gaskets designed to withstand directed hard spray (international standard for water resistant of IP65), scratch resistant display lens, integrated USB port with protective cap, and a custom designed mounting bracket. 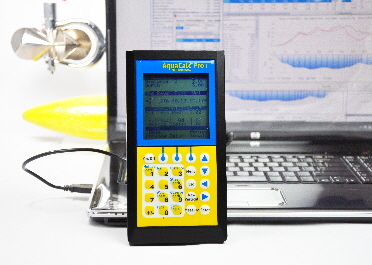 The AquaCalc’s measurements can be downloaded to a computer using the included AquaCalc DataLink and displayed in graphs and reports. The AquaCalc Excel Analyzer file will allow you to import and edit measurements after they have been downloaded to you computer. 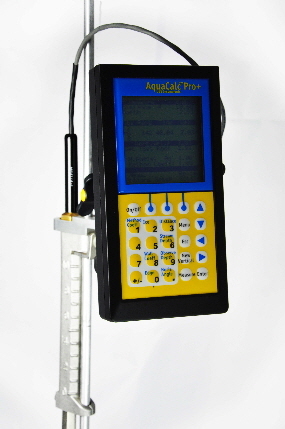 The AquaCalc Pro Plus has a USB connection built in. To use the USB connection on your Windows computer, you will need to install the AquaCalc Pro USB drivers. The AquaCalc Pro Plus USB Drivers are available from our website here. 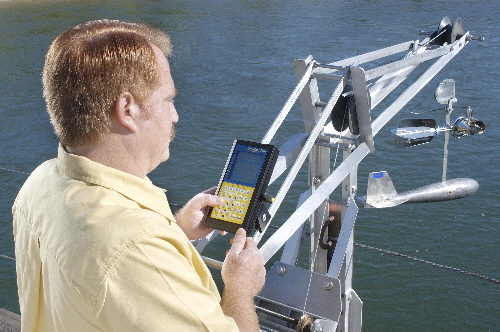 The AquaCalc DataLink program is used to download measurements from your AquaCalc. This new version automates the download of AquaCalc Pro Plus measurements, and can graph your measurement and print reports. Click here for details and to download DataLink. AquaCalc: It counts the clicks and more. Collecting stream data used to require juggling an armload of gadgets while counting clicks, writing notes, and performing calculations. Not any more. AquaCalc does it for you - -automatically. You input the depth and distance at each station. AquaCalc measures velocity and elapsed time. Then, AquaCalc calculates total stream discharge and mean velocity. After stream measurement is complete, you can upload the data to a laptop or personal computer. It’s the fastest, easiest, most accurate stream measurement instrument available today. Faster, more accurate stream measurement. 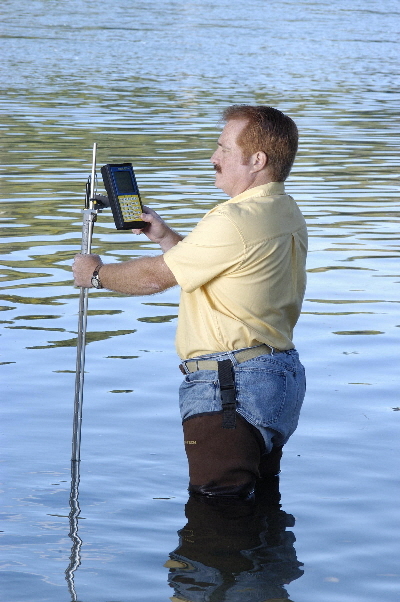 AquaCalc improves the speed, accuracy and efficiency of your stream measurements. The user inputs the distance and depth. AquaCalc measures revolutions and elapsed time calculating velocity and discharge. When all the stations have been measured, simply press a button and AquaCalc gives you the total discharge and mean velocity. AquaCalc completely eliminates time-consuming hand calculations, saving an average of 20 minutes per cross section. You can save as much as two hours a day - enough time to measure another station. AquaCalc saves even more time in error detection and re-calculation. With hand calculations, finding and correcting an error can take hours. But with AquaCalc, you can usually find and correct data entry errors in a few minutes. With AquaCalc and accepted measurement procedures, the chance of error is virtually zero. Math errors are eliminated. To help prevent procedural errors, AquaCalc prompts the user with a “flag” when an unusual entry occurs. AquaCalc uploads the data to your laptop or personal computer, so transcription errors are eliminated. The result: highly accurate data with less time wasted finding and correcting errors. Ability to perform ice measurements. AquaCalc lets you upload your data to a laptop in the field or your personal computer in the office, eliminating data entry time. And, because there are no math errors, quality control review becomes a much simpler and quicker task. You’ll appreciate the AquaCalc even more in bad weather. No more soggy note paper with hard-to-read notes! AquaCalc is easy to use in all weather conditions. The AquaCAlc Pro Plus case has an international rating of IP-65, which provides protection against dust and direct water spray. AquaCalc is manufactured from high-quality materials to withstand the occasional drops, vibrations, pollutants, temperature extremes and humidity variations that occur with normal, everyday use. Its weather-resistant design will stand up to prolonged exposure to sunlight, rain, sleet and snow. AquaCalc output looks similar to the USGS Measurement Notes Back Sheet. 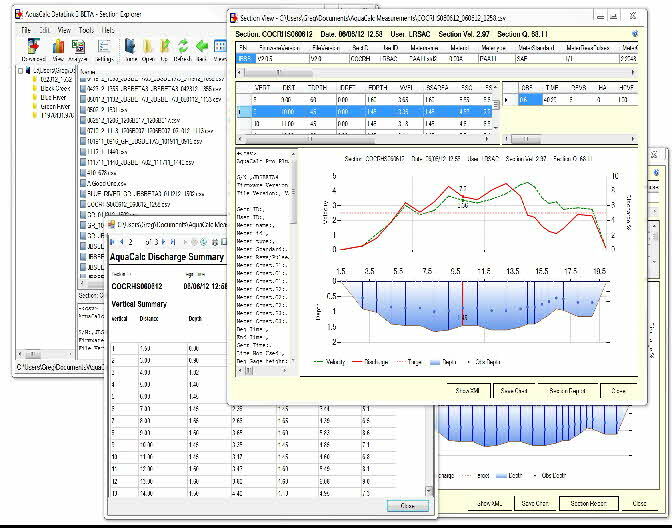 The included DataLink software can plot data in graph form, which can help inexperienced users understand the data at a glance.